Hello friends! If you have been following my posts you know that I have been busy taking a few courses and learning lots……. Yesterday was the day when I decided it was time to return to my journal and create a page just for me, by me and without following anybody else’s guide lines. Happily, I discovered I had a few more tricks in my bag! I started the double page spread with three colour washes – yellow, green and red. The colours were watered down 1:3 sploshed over and left to dry. Next I die-cut a double run of lace from my couture creations die in white card stock and lay a length to the left and right side of the double page spread, inked it up with some ‘Aged Mahogany’ Distress Ink, glued it down and left that to dry. An hour later I lay a piece of old lace curtain over the pages and spritzed a good coat of Dylusions white over everything. Peeling back the the lace revealed a rather gorgeous, soft dappled effect. Then I got out the water colour pencils and started drawing – I wasn’t a hundred percent sure I knew what I was going to do – I had my quote and that was about it – oh and I had just found an old Fiskars template with big butterfly wings that had appealed to me – I knew I wanted to do something with that if I could …. I drew the left side first and after that the right side just kind of drew itself. On the right hand page, the template made the outline of her wings and I drew and doodled inside the shape. 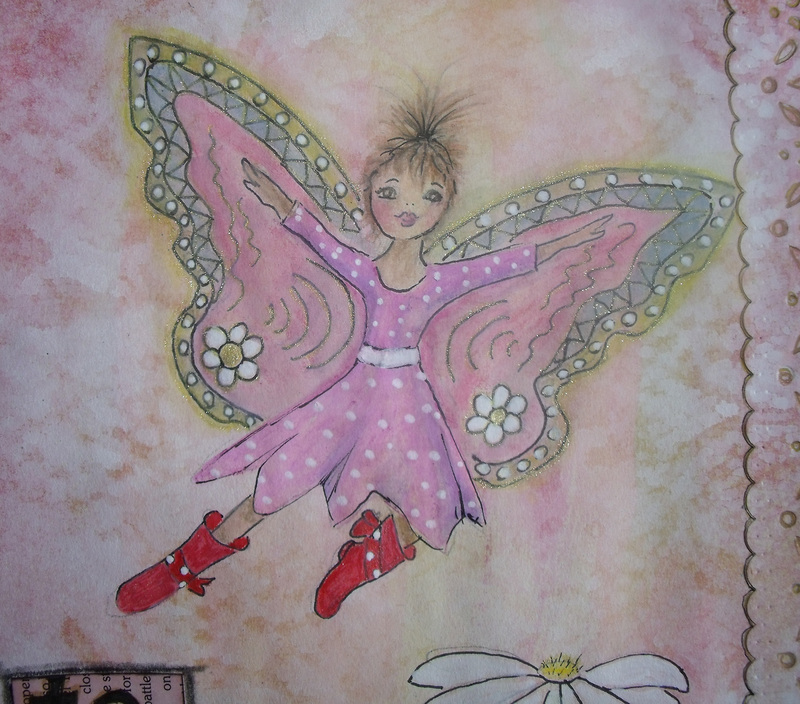 I edged the wings with a golden yellow Sakura gel pen – gotta have a little bling somewhere right? I liked that so much that when I had the quote all written out and mounted I edged that with the same pen……… if a little bling is good, a little more is even better! Finally the edges were treated to a light coat of gold paint, around the lace to define it a bit and top and bottom of the pages with a doodle or two, date stamped and voila, finito! Please do note that the girl is wearing a rather fabulous pair of red gumboots [galoshes, wellingtons, rain boots – depending on where in the world you are] with a big red bow with polka dots on them, because I saw a pair in a store recently and really, really wanted to buy them despite the fact that my garden is the size of a postage stamp….. As I couldn’t justify the expense the gardening gal gets to wear them instead! 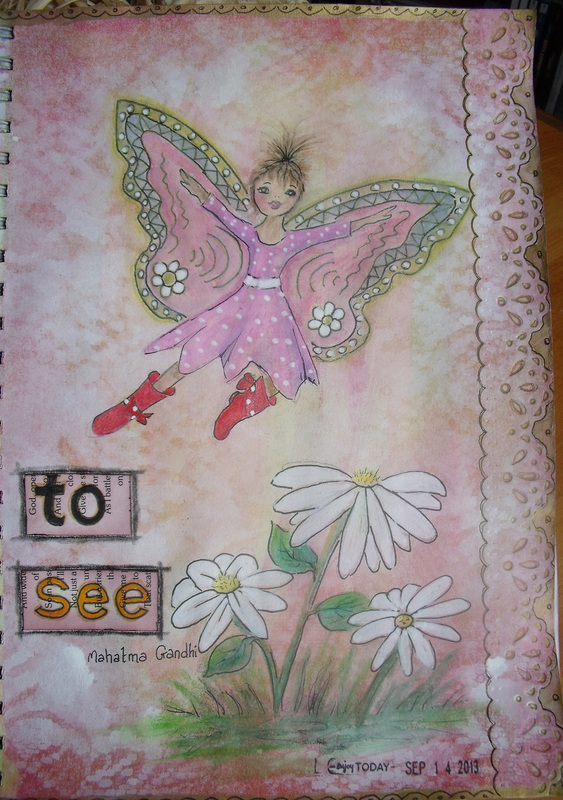 So, this is my latest page – what do you think? Thanks for dropping by today, do leave as note to say you’ve been – it’s always nice to hear from you 🙂 Have a great day! 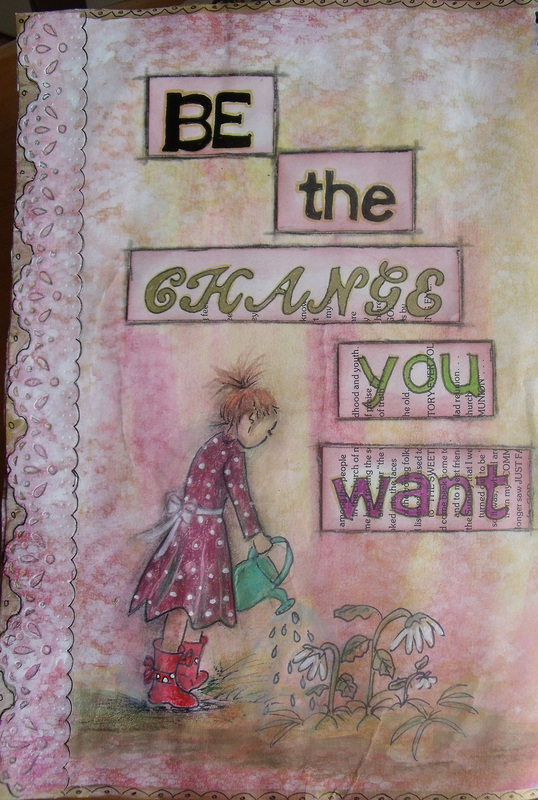 This entry was posted in Art Journal, Creations From My Craft Room, Creativity and tagged couture creations die, Fiskars, Gel pen, sakura gel pens, water colour pencils, watercolor pencils by thecontentedcrafter. Bookmark the permalink. I know I’m late but . . . that page is really lovely Pauline! 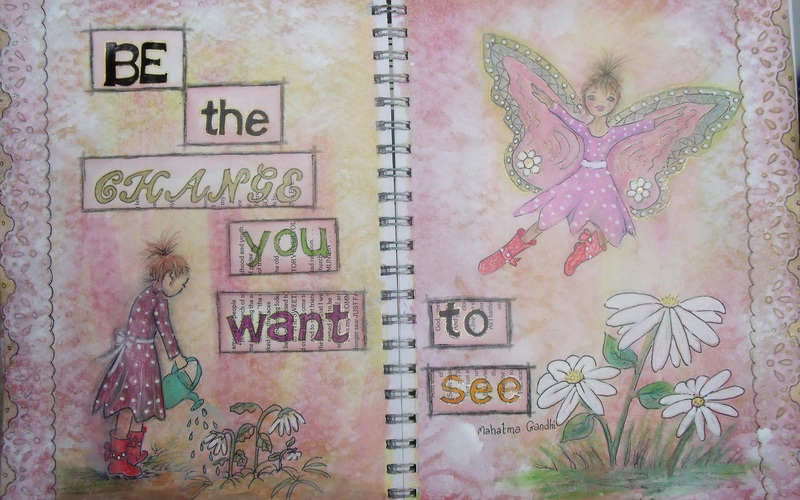 I love the way your gardener perks up the flowers and flies like a butterfly on page two. That is a wonderful quote and a way to be in the world. Thanks for sharing your journal page. You’ve created a lovely, personal page and we are lucky to share in the reveal.. I love those red boots, your work is so fun and inspiring, have you thought to publish a book? Thank you Elaine, those boots are just great aren’t they! I so want a pair!! I’d wear them to town in the rain . …. And no, I’ve never thought of a book – it’s all done just for the joy of it and the learning – and the fact that some of my few readers enjoy ’em too is just wonderful! You’ve really found your niche Pauline. I like to think I’m crafter but you are creating something wonderful from a blank page with you own mind and talent. 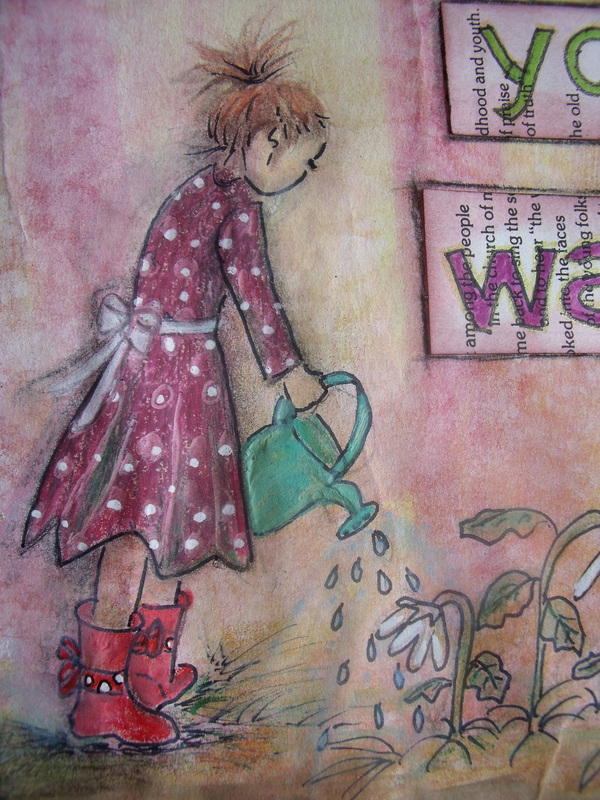 I love everything about your whimsical gardener from her cute little dress, awesome red puddle boots, APRON (I’m gaga for aprons) and most of all her hair. Oh and her little peck of a nose, cute profile. I’ve also admired how soft and blended your paints are. Do you brush over with a moist brush to blend? PS. The tinkling of water from the green can makes me smile too. LOVE it! [Smiling happily and blowing kisses] Thank you! Oh, I feel so – happy 🙂 Soft is new for me, so I’m quite impressed with myself at the moment. If you are referring to the background colours – I load a lot of water onto the page with them to get them soft – whether they are water colours or acrylics. I blend as I go – does that make sense? I just love watercolour work. I was at an art store a bit ago and looked at several watercolour pencil sets. I didn’t buy because I thought I should take a class. Do you you the pencils? Sorry hon – do I what the pencils? LOL, I see I missed a word.